High Quality & Odor-free - Mainly made of High Quality Premium Polyester. Anti-bacterial inner lining and daily life waterproof fabric protects your cosmetics from the penetration of moisture or bacterial. Large Capacity: 21 x 10 x 13cm. With multiple pockets this portable toiletry bag provides enough room for holding your makeup items, skin care products, toiletries and men shaving items. Make everything easy to find. Durable and Convenient: The built-in durable hanging hook is convenient to carry or hung on towel racks, shower rods and door knobs. Sturdy & Durable - Tidy and fine close stitching. The durable hook is convenient for hanging the toiletry bag wherever in the hotel or in the tent for space saving. 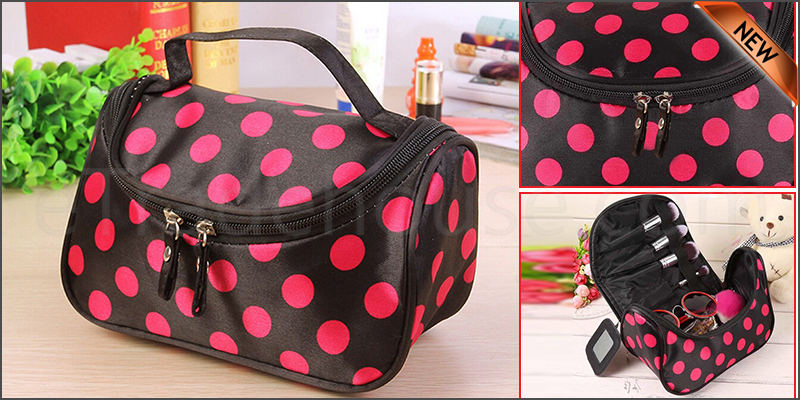 Classic and stylish polka pots patterns in contrast with its bright background make the cosmetic bag very chic. Premium accessories: smooth zipper and durable handle and precise stitching. Perfect for travel, vacation, business trip and other outdoor activities.